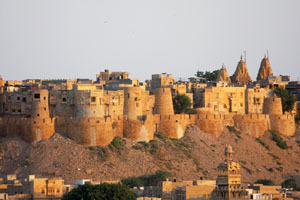 A city in Rajasthan in India, Jaisalmar has around 39,000 inhabitants. Increasingly touristic in nature, the city will seduce you with the richness of its sculpted Havelis facades carved by masters dating from the 18th Century, also the Jain temples, the fort and fortress, the 7 storey Maharajas Palace, and the animated and colourful streets and alleys. Situated at the gateway to the desert, it is the perfect departure point to explore the latter on a camel excursion which will certainly be suggested. Other places worth visiting in the surrounding area include the Maharawal necropolis, the Bara Bagh oasis with its royal chhatri (cenotaphs) decorated with superb carved ceilings and equestrian statues. The lake of Gadi Sagar is also a unique place to visit; it is home to many species of aquatic birds and is surrounded by small temples, a lovely place to stay for a while, relaxing on a boat as many Indians do. You will have no trouble finding places to stay and eat in the city; numerous desert excursion specialists have set up company in the city so encouraging the growth of the necessary infrastructure to accommodate and welcome them. It is recommended that you reserve your hotel accommodation in advance as the better equipped hotels tend to book up fast.